The upcoming OnePlus 7 is certainly one of the most talked phones in the market lately. Amidst all the rumours and speculations, it is reported that OnePlus 7 will be offered in 3 variants when launched. Previously, a new speculation surfaced on the internet claiming that OnePlus 7 will be seen in a 'Pro' avatar this time around. Before this rumour could settle down, a new leak about OnePlus' 5G variant is out and it is believed that the Chinese smartphone manufacturer could launch the next flagship device in 3 versions. As per the market reports, it is also learnt that OnePlus will be introducing OnePlus 7 in different specifications & features, which we saw on Samsung Galaxy S10. The three new variants will be called as OnePlus 7, OnePlus 7 Pro & OnePlus 7 Pro 5G, as per the tipster Ishan Agarwal. Amazon Fab Phones Fest Sale 2019: Last Day To Get Discounts on OnePlus 6T, Apple iPhone XR & Other Smartphones. According to Weibo leak, the new OnePlus 7 will be seen with 6.67-inch Super Optic AMOLED dual-edged display which will be very similar to the one incorporated on the Galaxy S10+. The leaked images of the phone hint that there will be a notch-less and hole-less display confirming the presence of the pop-up selfie camera module. The tipster didn't share any image of phone's rear profile. The About section of the phone also revealed that the new OnePlus 7 will be powered by the latest Snapdragon 855 chipset which will be clubbed with up to 8GB of RAM, 256GB of internal storage. The leaked images also confirmed that OnePlus 7 will be the first device from the phone maker to feature triple rear cameras. The triple rear camera setup reportedly will comprise of 48MP lens, 16MP sensor and an 8MP snapper. OnePlus 7 Pro With Curved OLED Screen Leaked Online Ahead of Launch. 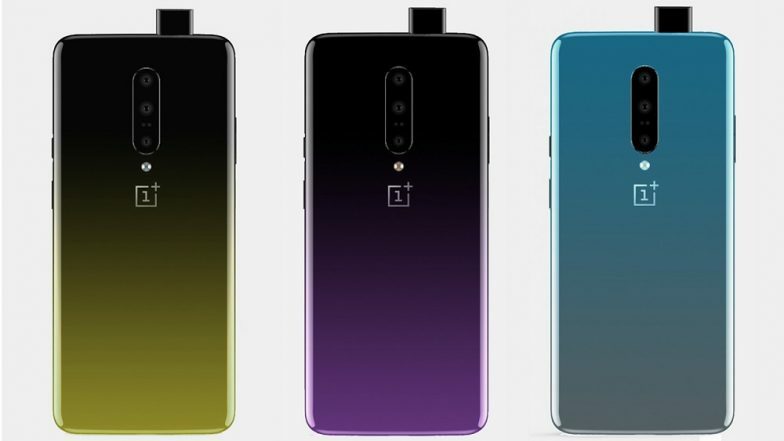 The tipster also revealed the model numbers of these variants, which are GM1901, GM1903, and GM1905 for OnePlus 7. On the other hand, OnePlus 7 Pro and OnePlus 7 Pro 5G variants are listed as GM1917 and GM1920 respectively. It is important to note that the leaked image of the phone via Weibo featured the same GM1915 model number. If the speculations are true, then it will be the first time when OnePlus will be launching its flagship phone in several variants featuring different set of specifications and features. Previously, the smartphones from OnePlus differed in terms of RAM and internal space only. We can expect more details and images of OnePlus 7 hitting the internet as the launch date approaches. It is speculated that the OnePlus 7 will be launched in the global markets by May 2019.